JOHANNESBURG (AP) - Inspired by Nelson Mandela's struggles in South Africa, a young Barack Obama joined campus protests in the U.S. against the racist rule that kept Mandela locked away in prison for nearly three decades. Now a historic, barrier-breaking figure himself, President Obama arrived in South Africa Friday to find a country drastically transformed by Mandela's influence - and grappling with the beloved 94-year-old's mortality. It was unclear whether Mandela's deteriorating health would allow Obama to make a hospital visit. The former South African leader is battling a recurring lung infection and is said to be in critical condition at a hospital in the South African capital of Pretoria. Speaking to reporters on Air Force One as he made his way to Johannesburg, Obama said he would gauge the situation after he arrived. "I don't need a photo-op," he said. "And the last thing I want to do is to be in any way obtrusive at a time when the family is concerned about Nelson Mandela's condition." Obama's visit to South Africa is seen as something of a tribute to the man who helped inspire his own political activism. The president will pay homage to Mandela at Robben Island, the prison where he spent 18 of his 27 years in prison. And with South Africa's ruling party, the African National Congress, facing questions about its effectiveness, Obama will urge the government and the South African people to live up to the democratic example set by their first black president. "He's a personal hero, but I don't think I'm unique in that regard," Obama said during a news conference Thursday in Senegal, the first stop on his weeklong Africa trip. "I think he's a hero for the world. And if and when he passes from this place, one thing I think we'll all know is that his legacy is one that will linger on throughout the ages." Obama and Mandela have met just once, a hastily arranged meeting in a Washington hotel room in 2005 when Obama was a U.S. senator. A photo of the meeting hangs in Obama's personal office at the White House, showing a smiling Mandela sitting on a chair, his legs outstretched, as the young senator reaches down to shake his hand. A copy of the photo also hangs in Mandela's office in Johannesburg. Since then, the two have spoken occasionally by telephone, including after the 2008 election, when Mandela called Obama to congratulate him on his victory. The U.S. president called Mandela in 2010 after the South African leader's young granddaughter was killed in a car accident. Obama also wrote the introduction to Mandela's memoir, "Conversations With Myself." Despite the two men's infrequent contact, people close to Obama say his one-on-one meeting with Mandela left a lasting impression. "He is one of the few people who the president has respected and admired from afar who, when he met him, exceeded his expectations," said Valerie Jarrett, Obama's senior adviser and close friend. Obama's own political rise has drawn inevitable comparisons to the South African leader. Both are Nobel Peace Prize winners and the first black men elected to lead their countries. But their paths to power have been vastly different. While Mandela fought to end an oppressive government from the confines of a prison cell, Obama attended elite schools and rose through the U.S. political system before running for president. "President Obama would believe that the challenges he has faced pale in comparison to those faced by President Mandela," Jarrett said. "It's happening an ocean away," Obama said, according to a retelling of the story in his memoir "Dreams From My Father." ''But it's a struggle that touches each and every one of us. Whether we know it or not. Whether we want it or not." More than 30 years later, as he traveled through the African continent, Obama recalled the influence Mandela had had on him during that period of his life. 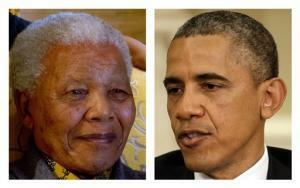 "I think at that time I didn't necessarily imagine that Nelson Mandela might be released," Obama said Thursday. But the president said he had read Mandela's writings and speeches and understood him to be a man who believed in "treating people equally and was willing to sacrifice his life for that belief." Following his release from prison, Mandela was elected president in 1994 during South Africa's first all-races elections. He served just one term, focusing in large part on racial reconciliation in the post-apartheid era, and retreated from public life several years ago. The most recent images of him depict a frail man apparently approaching the end of his life. While South Africans have long been loath to talk about Mandela's inevitable death, there is now a growing sense in the country that the time is near. Well-wishers have delivered flowers and messages of support to the Pretoria hospital where he is being treated, and prayer sessions have been held around the country.